Every baby deserves to have their own quilt or blanket. These quilts can be taken with them through their early years and stored in their teenage years for them to look at and reminisce when they are older. Baby quilts are great to take with you when travelling or at a friends house, as they can double up as a blanket and as a clean “rug” that your baby can lie or crawl around on while still feeling secure. It is also fantastic to know that wherever you go you have something that is safe, clean and familiar for your little one to play on, as when you are at other peoples’ houses, hotels or moving around, often the carpet, flooring and gardens are not always the most sanitary place for a baby to play. As a general rule, you should always use natural fibres when making a baby quilt. 100% cotton is ideal as there are less irritants and chemicals that have been added and could potentially annoy or aggravate a baby’s sensitive skin. 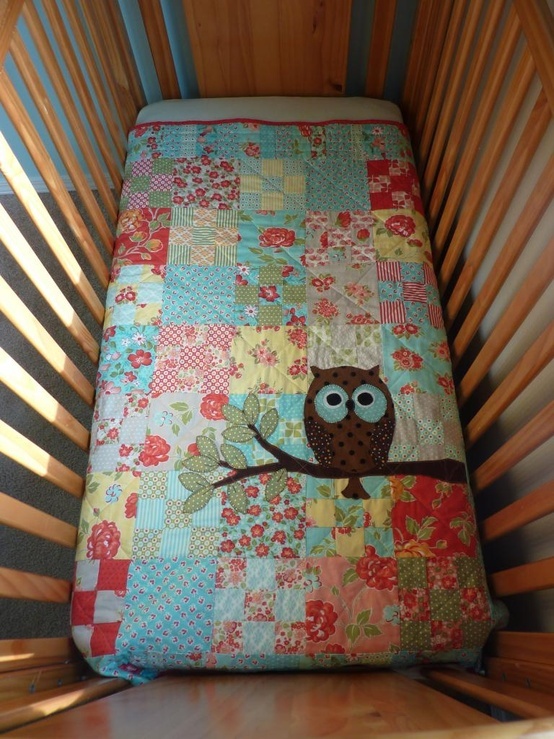 Always try to make the quilt a little bit bigger than their crib or bassinet as then you will have a little more quilt to tuck in when they get bigger and to wrap them up in when it is cold. If you are not sure of the size then measure out the length and width of the crib and add either a half or whole foot around the edge. This way there will always be enough quilt and after your baby has grown you can use it to throw over a chair or at the end of a bed when you get rid of their cot. If you are thinking about making a quilt that you would like your child to keep for along time, make sure you use a strong and versatile fabric that will last through many washes, dirt and being pulled around. You may want to consider the colors and patterns that you use before you make your baby quilt. 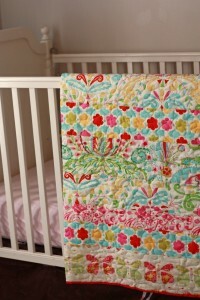 If the quilt if for the baby’s bassinet then traditional baby patterns and colors are lovely. However, if it is for a crib then you might want to consider something that a little boy or girl would like up until and beyond the age of four. We all know how kids can love something one minute and hate it the next. Most the time you are safe with their much-loved “blankie” or “quilt”, however it never hurts to plan! When choosing colors to mix together, consider that the quilt will get very dirty and used a lot (hopefully!). This means that generally the quilt will need to be washed countless times. It is fairly safe to assume that quilts that get dragged though the playground, held when watching TV, and that they cuddle up to at night-time, tend to mean much more than the one thrown over the back of the chair that hardly gets used. So make sure you use durable fabric and thread! 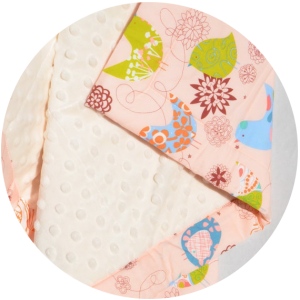 When making your baby quilt it is a good idea to always use fabrics that can be washed together. For example, a white quilt with red seams or central motif might cause a bit of a problem if thrown in on the hot cycle! You don’t want to ruin the baby’s quilt unnecessarily, so if you are using a bright color, make sure you wash it a couple of times before patch-working, especially if you mix it with paler fabrics. This should remove a fair amount of the dye (if it runs at all!) and therefore will be a little safer to wash. If you are at all unsure then hand wash your quilt or wash on a cold cycle. For more information make sure to read the section on how to wash a quilt. After researching the opinions of a number of experienced quilters, a common theme seams to crop up again and again. Babies tend to like the feel of satin on the edge of the quilt (like so many baby blankets have! ), and they also like flannel-like materials. Yes this is not exactly a revolutionary idea, however many people get very excited about the beautiful materials and lovely colors that they could use, and forget that babies and small children can be very picky! If you use a beautifully patterned material that doesn’t feel as soft as their favourite blanket then your quilt may not be used as much as you would like. When it comes comes to babies and fabric there is only thing that is certain: flannel is a baby’s friend! 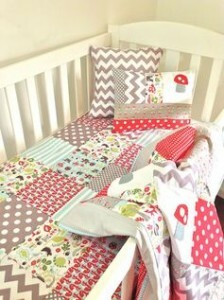 Babies love it, we all know people use sheets of flannel for cribs so it makes sense to use it in their quilts as well. Alternatively, if you are making a quilt for a baby’s bedroom to go on the back of a chair or at the end of a bed then you have a lot more freedom when it comes to materials and styles. Another useful hint is that it is not always practical to make a baby quilt out of white or very pale colors. It is very tempting to use beautiful baby blues or pale yellows and creams, however as children tend to get a little grubby from time-to-time so does the quilt, meaning that the quilt will spend a lot of time in the wash! Therefore if you are set on using pale and soft baby colors then it is a very good idea to machine sew as the stitches will be very strong and perhaps a little closer together, ensuring that the quilts lasts though 300 or more washes! Hand quilting should more than ensure the quilt will last however as it is often irregular and being homemade it is not always recommended for quilts or anything that is to be machine washed over and over again. If you are wanting to use a baby motif for the centre of the quilt you don’t always have to stress over hours of making one. There is plenty of pattern material available in stores these days that you can simple slot into the quilt (rather than patchworking your own) and you simply quilt around it. This is actually very common in baby quilts as they grow through them quite quickly. So if you want your baby to have a couple of quilts while they grow then you can make one of these fairly quickly and easily, especially if you use a machine! 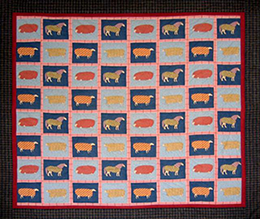 For more information on baby quilts, check out our section on baby quilt patterns.